So, it’s soon going to be spring and I live in Canada. I know that mentioning that fact will conjure pictures of palm trees and sandy beaches snowshoes, sled dogs and hockey players for you. Oops. Sorry. I went off on a flight of fancy there. The fact is that this country is so big that you can’t make any generalized statements like that. Actually, the same is true for small countries, which only goes to show that stereotyping is just a form of intellectual laziness and convenient labelling. But I’m digressing again. I have never gone dog sledding in my life. Ditto snowshoeing. I watch hockey now and then but have never played it. 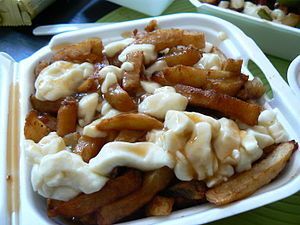 I hate poutine. Worst of all, since I’m half French I’m supposed to like this crap and have secret family recipes for it hidden in the attic. Soggy fries (I am NOT going to refer to them as French – they never were and never have been) buried under some sort of packaged sludge masquerading as “gravy”. Would probably work as a below zero lubricant for your snowmobile. Then this mess is further assaulted by a load of “cheese curds.” Yuck. See attached picture. Jamie Oliver would choke if he saw this stuff. And yes, we let our kids eat it. Encourage them, even. Whoever invented this dreck should be buried in it. I like maple syrup but I don’t collect it and turn my back yard into a frozen syrup arena. Most of us do not live in igloos, but some of our first nations people are trying to hang on to the knowledge of how to build one, along with other knowledge that we attempted to either beat out of them or steal from them, including the game of lacrosse. We changed it, called it hockey and then wouldn’t let them play it. Some of us get terrifying winters and some of us don’t. I live in a part that used to be fairly predictable but isn’t any more. Global warming, anyone? Not all easterners grow potatoes and wrangle lobsters. It’s true that some of them have a pretty strong accent, but so what? Canada produces some of the best ice wine in the world. Go figure. The Tim Horton’s coffee shops are really popular in this country. They’re named after a hockey player. Some people think that this is classic Canadiana. I do not. Sometimes, other nationalities think that we’re a sort of watered down version of the U.S. I once heard Canadians referred to as “plastic Americans.” Ever mistaken an Austrian for a German? They hate that and can respond rather ferociously to it. We feel the same way about the assumption that we’re Americans. Some Canadians think that in order to be a “success” you have to go to the U.S.
What about the tar sands and the oil pipelines? An environmental disaster? I believe so. Some people say that we have a self-esteem issue. Our politicians leave a lot to be desired and they exploit holes in our electoral system that you could drive an aircraft carrier through. We aren’t doing much about it. What say you? What’s your opinion? Where do you live? What stereotypes do you face? Way to go Lynette! Spoken like a true Canadian. There is a saying about Canadians that follows what you are saying. We may not know who we are but we know we’re not Americans. I live in one of those semi-desert areas you mentioned. In fact only 90 minutes south of me is the only true desert in Canada. The misconceptions about us are amazing. As usual I loved the post and I’m looking forward to part 2. Have a good weekend my friend. I’ve never heard that saying before but it certainly plays into that notion that we have self-esteem issues going on! And yes, the misconceptions are varied and many. Thanks so much for your comments, Nelson 🙂 You have a good weekend, too, friend. I love this – made me laugh. Never heard of poutine but it looks disgusting – along the same lines as our jellied eels. Never a fan of Poutine as well! Good to know that I’m not alone in my dislike, but I think the jellied eels may put poutine to shame on the gagmeter! This was really fun to read (being from the US). I am from Chicago and live in Belgium now. I mostly face the fact that they think I drink Starbucks, I am superficial and don’t know anything about any other country because I’m egocentric. And I also don’t know anything about the US. They tell me how it is there (especially after they’ve seen it on an American TV program or YouTube). I can relate to what you say about what people assume about Canadians.